SBI SO (Contractual )Notification 2018: The State Bank of India has released the official SBI SO notification 2018. The SBI SO recruitment notification is for the recruitment of Specialist Officers (contractual) in State Bank of India. The SBI Specialist Officer is one of the most sought-after jobs in India and hence, is highly competitive. Online registration for SBI SO exam 2018 has started from 31st January 2018. The last date to fill up the online SBI SO application form is 15th February 2018. Vacancies for 20 different positions of Specialist Cadre Officers (contractual) have been announced in the SBI SO notification. Aspirants must go through the SBI SO notification thoroughly before filling up the SBI SO application form. In this article, we will give detailed information about SBI SO notification 2018. Read on to find out. The SBI Specialist Officer eligibility criteria – age limit, educational qualification, and experience/skill requirement for the 20 positions of SBI Specialist Officer (Contractual) are different. Candidates, if they fulfill the eligibility criteria, can apply for more than one post separately. Candidates must check the eligibility criteria for the post they are applying before filling up the SBI SO application form. 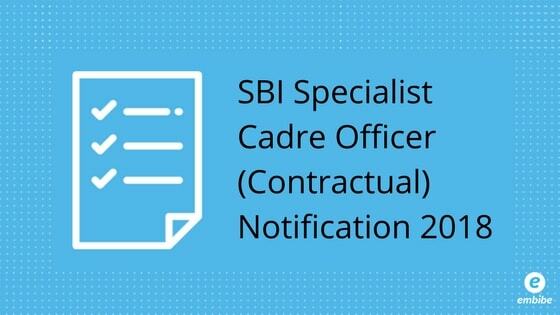 As per the SBI SO notification, the contract period for these 20 Specialist Cadre Officer positions is 5 years. The contract period is renewable by further 5 years at the discretion of the bank. Step 3 Click on “Apply Online”. Step 5 Submit your Basic Details like Name, Email ID, Phone Number and register yourself. Your Registration Number and Password will be provided. Step 6 Upload the scanned image of your Photograph and Signature and click on “Next”. Step 7 Enter your other details, like academic details, date of birth, experience, etc. and click on “Next”. Step 8 Check if you have entered all the details correctly and click on “Next”. Step 9 Upload the necessary documents and click on “Next”. Step 10 Make payment of SBI SO application form fee using Credit Card/Debit Card/Internet Banking. Step 11 E-Receipt of the transaction and your online application form will be generated. Take a print out of both and keep it for future reference. Documents once uploaded cannot be edited. Candidates must ensure that the size of the files shouldn’t exceed 500 kb. Page size of the documents should be A4. According to the SBI SO notification, candidates will first be shortlisted based on certain parameters decided by the Shortlisting Committee. The shortlisted candidates will be called for one or more rounds of Personal Interview. Final merit list will be made based on the candidates’ score in the Interview only. We hope this detailed article on SBI SO Notification (Contractual) helps you. If you have any query, feel free to comment below and we will get back to you.